Tiny is the new big and residents of tiny houses live it up in a huge way. 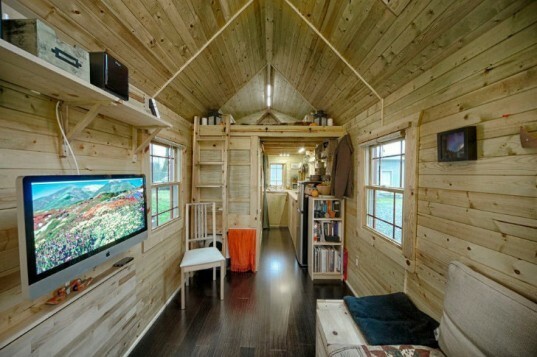 Meet the Chris and Malissa Tack, a photographer and 3D artist who live in a 140 sq ft tiny house in Snohomish, WA. Inspired by plans from Dee Williams of Portland Alternative Dwellings and Jay Shafer's tiny houses, the duo designed and built their own tiny, solar panel-equipped home. The Tiny Tack House has all the comforts of regular-sized home, yet it fits neatly onto a 7 x 20 ft trailer. The couple began designing their home back in 2011 and made sure to think about how they would use the space before ever beginning construction. Working from home is a necessity for them both, as well as having a spot for friends to crash and a place for their two cats. They worked all of that into their plans and still managed to fit in a galley kitchen, a bathroom, a lofted bedroom and storage. Before moving into their 140 sq ft space, the couple got rid of most of their possessions and pared down to only the necessities. In the end, the home cost them approximately $15,000-$20,000 to build. The bathroom features a creative wooden wine barrel tub shower, and a five gallon bucket for the toilet, which is then composted. The duo says they went with the Dee Williams way, which eliminates the need to hook into a septic. Their lofted bedroom is large enough for a queen bed and the living area features a seating bench that triples as storage and a pull out bed for guests. A fold up table on the wall doubles as a dining table and a work table with a large Apple screen that serves as the house computer and tv. A galley kitchen has a small sink and a two burner propane stove. Heating is also provided via propane, wool insulation minimizes energy loss and a photovoltaic system provides electricity. Lots of windows and a skylight provide a ton of natural lighting. If you’re interested in building your own tiny house, Dee Williams and Portland Alternative Dwellings is hosting two workshops this spring. 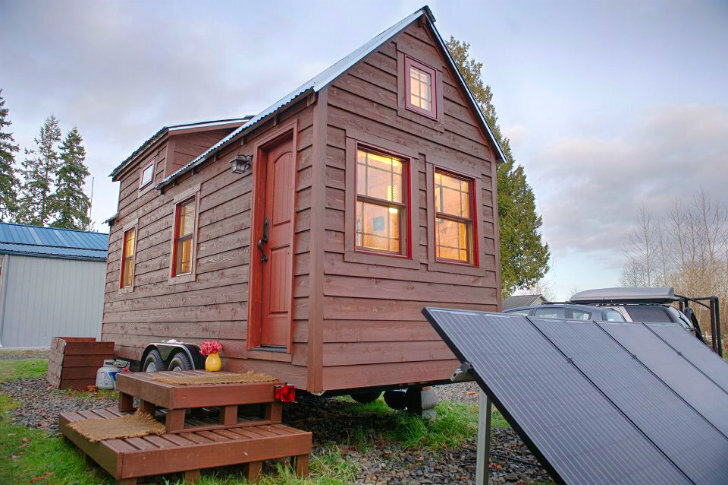 The 2-day workshops on February 23rd & 24th and then on April 27th & 28th, 2013 will give you a crash course in building your very on tiny house on a moveable trailer. If you like Chris and Malissa’s home, you can buy plans for the Tiny Tack House or their new Tropical Tiny House for $175. The couple began designing their home back in 2011 and made sure to think about how they would use their home before ever beginning construction. Working from home was a necessity for them both as well as having a spot for friends to crash and a place for their two cats. They worked all of that into their plans and still managed to fit in a galley kitchen, bathroom, a lofted bedroom and storage. Before moving into their 140 sq ft space, the couple got rid of most of their possessions and paired it down to only the necessities. In the end, the home cost them approximately $15,000-$20,000 to build. The bathroom features a creative wooden wine barrel tub shower, and a five gallon bucket for the toilet, which is then composted. The duo says they went with the Dee Williams way, which eliminates the need to hook into a septic. Detail view of the kitchen and the spice rack. Lots of counter space on which to cook. Their lofted bedroom is large enough for a queen bed and the living area features a seating bench that triples as storage and a pull out bed for guests. Heating is also provided via propane and wool insulation minimizes energy loss and a photovoltaic system in the yard provides the power. Lots of windows and a skylight provide a ton of natural lighting.